Derived from the renowned multi-volume International Encyclopaedia of Laws, this practical analysis of competition law and its interpretation in the Slovak Republic covers every aspect of the subject – the various forms of restrictive agreements and abuse of dominance prohibited by law and the rules on merger control; tests of illegality; filing obligations; administrative investigation and enforcement procedures; civil remedies and criminal penalties; and raising challenges to administrative decisions. Lawyers who handle transnational commercial transactions will appreciate the explanation of fundamental differences in procedure from one legal system to another, as well as the international aspects of competition law. Throughout the book, the treatment emphasizes enforcement, with relevant cases analysed where appropriate. An informative introductory chapter provides detailed information on the economic, legal, and historical background, including national and international sources, scope of application, an overview of substantive provisions and main notions, and a comprehensive description of the enforcement system including private enforcement. The book proceeds to a detailed analysis of substantive prohibitions, including cartels and other horizontal agreements, vertical restraints, the various types of abusive conduct by the dominant firms and the appraisal of concentrations, and then goes on to the administrative enforcement of competition law, with a focus on the antitrust authorities’ powers of investigation and the right of defence of suspected companies. This part also covers voluntary merger notifications and clearance decisions, as well as a description of the judicial review of administrative decisions. Its succinct yet scholarly nature, as well as the practical quality of the information it provides, make this book a valuable time-saving tool for business and legal professionals alike. 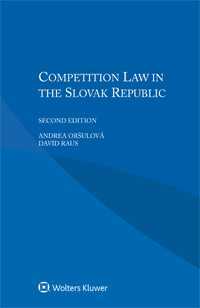 Lawyers representing parties with interests in the Slovak Republic will welcome this very useful guide, and academics and researchers will appreciate its value in the study of international and comparative competition law.